Sammylou's Adventures In Craftland: A bit of Bot! 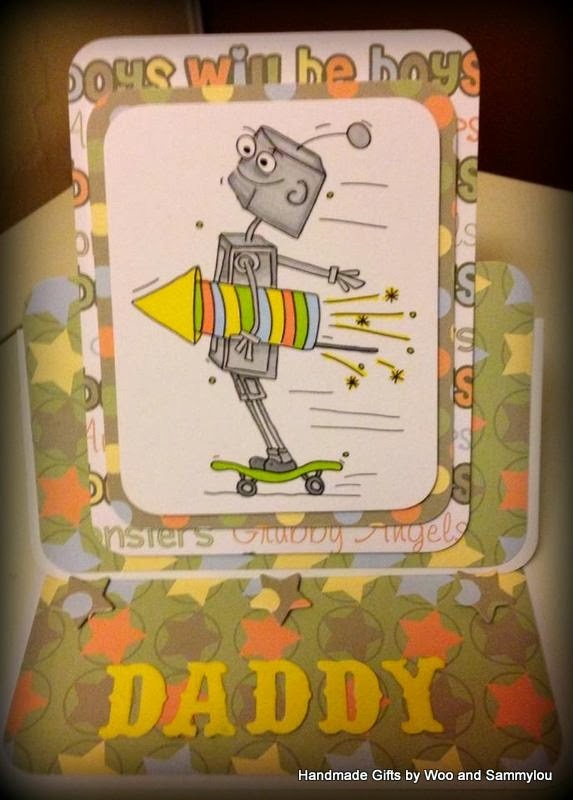 Happy Hump day to you all, it's my turn over on the Get Funky and craft blog today and I am sharing a card using the new Boys will be Boys download and the fabulous digi Bot! As you will see, Bot is quite a character and looks like he's up for any adventure. I have used him to make the card I have shared on the Get Funky blog and also an easel card for my Husband from our son. It's not his birthday until the 3rd of this month so I'm hoping he doesn't see it! I used pro markers to colour him to match the papers and added the die cut Daddy. The papers themselves just pop with colour and I think my Husband will be really pleased. Our son definitely approved! I am busy adjusting to my new work hours which have changed to accommodate my son starting school so I have been a little quiet of late. I hope you don't hold it against me and bear with me as I try to figure out how to organise my blogging and card making around this change.